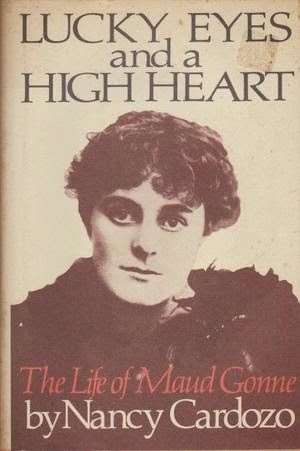 Maude Gonne – Lucky Eyes and a High Heart. Nancy Cardozo. New Amsterdam, New York, 1990 (1978). Pp 468. This review was written on August 23rd 2004. My brother Seán picked up this book from his daughter when he paid her a visit on Long Island in June 2004. He had a high opinion of the biography. Maude Gonne was the daughter of a British army officer, Tommy Gonne, who was a loyal and committed servant of Queen Victoria’s. 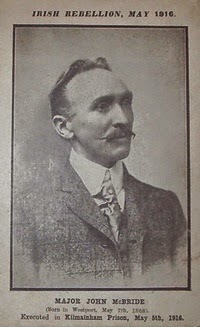 He was stationed in Ireland during Fenian times and later during the time of Parnell and the Land League. Her mother, née Cooke, whose family was ravished by tuberculosis, died from the disease when Maude was four years old and shortly after her sister Eileen was born. The Cookes had ancestors who were landowners in Mayo but by mid-nineteenth century they were a well established and wealthy family in London who had prospered in the wine trade. The Gonnes were reasonably well off, probably because of the connection with the Cooke family. Maude Gonne had an unusually liberal and unconventional upbringing for these Victorian times, spending much of her time away from her father in Ireland, England and Europe. She was precocious, self confident and unwilling to accept the prevailing conventional restrictions on women. When with her father she was encouraged by him in her liberal ways and as she matured into adolescence and early adulthood as a tall and strikingly beautiful woman, she accompanied him everywhere as a companion and close confidante. During her younger years in Ireland she enjoyed the privileges and the active social life of the Anglo-Irish establishment but, like some other arrivals from England, she became conscious of the British repression in Ireland and she felt an increasing concern about the distressful state of the indigenous Irish Catholic population. She stated in an interview many years later, and long after she had joined the separatist movement, that it was the evictions that had transformed her into an Irish rebel and that this had happened as early as her nineteenth year after she had spent a year or two of an independent existence roaming the four corners of Ireland as a privileged member of the governing classes. She eventually influenced her father to withdraw the British troops from police duties in Ireland and thus to stop the army’s role in the evictions. He eventually resigned his commission, was increasingly influenced by her and by Irish nationalism, and was about to stand for parliament as a member of the Irish Parliamentary Party under Parnell when he died tragically and unexpectedly from typhoid fever. For Maude, her father’s premature death was a devastating blow but in no way did it change her lifestyle nor did it affect her commitment to the Irish cause. She was left with a generous inheritance and during her life time she spent much of her time travelling between Ireland, England and France. She maintained a flat in Paris as well as a residence in Dublin. From the early 1880s she devoted much of her life to alleviating the sufferings of the evicted tenants during the land wars and she was largely responsible for the ultimate release of the 27 Fenian prisoners from the horrors of the British jails. From her early days she was to complain about the British maladministration of Ireland. 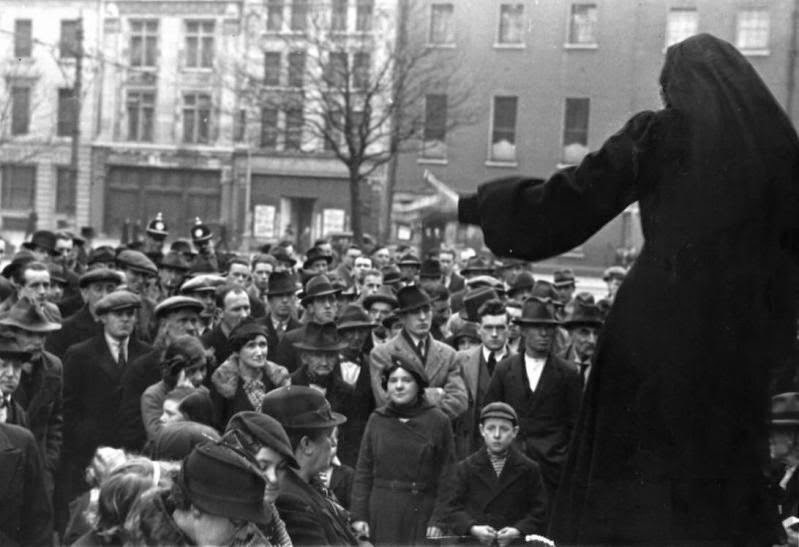 While she became quite extreme in her political views, like many of the women and the widows of those who were active during the 1916-1922 period, she always claimed that her only mission during her long and devoted life was the alleviation of the Irish peasantry and the Irish political prisoners, including those in prison during the civil war. She was equally concerned about the fate of the Boers during the war in South Africa and did much to encourage support for the insurgents there. She was eventually to distance herself from all secret revolutionary organisations such as the IRB because of their abysmal history of failure, attributed to the activities of British spies, as was apparent during the Fenian times. With her inseparable friend and would be lover, William Butler Yeats, she resigned from the IRB and determined from that time that all her nationalistic activities would be carried on above board. Yet I number him in the song. He, too, had been changed in his turn, ---. Incredibly, Maude Gonne managed to conceal her relationship with her French lover and the birth of her first two children from her many friends and associates in Dublin and London. She passed off her daughter Iseult as an adopted child! Apart from her many travels in Ireland to visit the evicted tenants and her visits to prisons in Ireland and England, she was a prolific writer and public speaker in her various campaigns in the home islands as well as France, the United States and Europe. Her energy was prodigious despite chronic ill health and recurring fatigue the result of her many crises and crusades. Pope Leo X111, who was a particularly powerful figure in Rome at the end of the nineteenth century, at first supported a peaceful solution to the land problems in Ireland. However, while she was in Rome, Maude Gonne met an English emissary who was sent to the Vatican by the British. No doubt it was he who successfully influenced the Pope to condemn the land reform leaders and to support the British in their policies of repression and deportation. So much for the power politics of our holy mother church! One of the impressions that emerges from the Maude Gonne biography was how ruthless the British were in hiding the Irish situation from the international scene. It was in publicising the shortcomings of the British administration of Ireland that Maude Gonne and her supporters played such a crucial role. Of course her story confirms that power corrupts, for even after the land settlement we had the cattle dealers and other native Irish who, because they had the necessary money, not infrequently treated the tenants as badly as did the hated landlord. This biography makes it clear that there were many strands of the nationalist movement in Ireland which made it inevitable that fundamental differences of opinion and different concepts of self government and of separatism would lead to serious divisions, not only between North and South but also within the boundaries of the two parts of Ireland. These differences within the country were at least as important in delaying a solution to Ireland’s problems as were the aspirations and imperialist motives of Westminster and the Tory tradition. That many nationalists became more extreme in their sense of separatism as the twentieth century progressed was also apparent and was largely caused by the 1916 Rising, the Northern Unionists, Lloyd George’s attempt to impose conscription on Ireland, and the bitterness on both British and Irish sides engendered during the last six months of the War of Independence. Patrick Pearse as late as 1912, speaking at a public meeting to an enthusiastic gathering of home rulers, stated that he would be satisfied as long as home rule with a modicum of self-government was granted at an early date. He added prophetically that if home rule was defeated the result would inevitably lead to blood letting and violence. Perhaps violence was inevitable because of the intervention of Sir Edward Carson, the Ulster Unionists and the treasonable members of the Tory party who encouraged the Ulster dissidents. This is a fine biography of a very remarkable woman and gives a good insight into the progress of Irish nationalism and the emergence of a new generation of educated and capable indigenous people. However, it would have been a greater tribute to Maude Gonne and her contribution to the Irish people if the author had finished the story at 1922 with the passage of the Treaty by Dáil Éireann. Unfortunately, the author allowed herself to be influenced by a biased and bitter account of the first Irish administration which does little credit to the reputation of the subject of her biography. 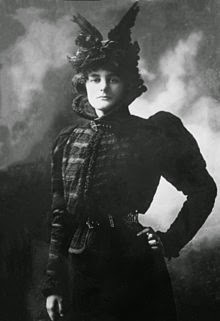 Maude Gonne may well have shared the anti-treaty view of so many of the female activists at the time but she herself would hardly have approved of the criticisms of the author who described the acts of the Irish government as tantamount to the behaviour of the worst of British times. If the Irish government broke the rules of war, it was in response to the atrocities and mindless vandalism of the irregulars. 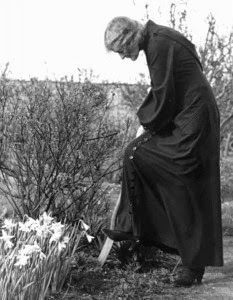 Maud Gonne in the grounds of Roebuck House. 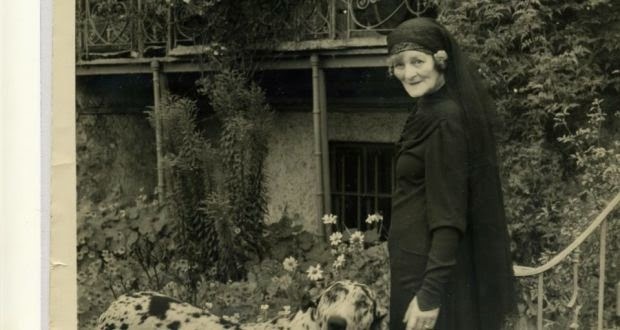 PS: Maude Gonne lived for many years after the Treaty in Roebuck House in the Palms in Clonskeagh, a pleasant cul-de-sac where Louise and I moved in 1995. I pass Roebuck House every day and wonder at the size of the building. It now houses at least eight fairly commodious apartments and may have up to ten cars parked there every day. I expect that Seán McBride must have lived there too during his earlier years before his marriage. See my earlier review of his biography by Catriona Lawlor and Terry de Valera.-R.